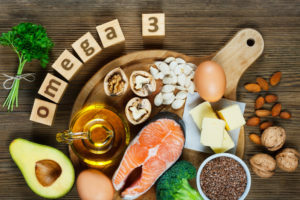 Caution: People with bleeding disorders or who are at higher risk for bleeding, or certain other health conditions, should avoid Omega-3 supplementation. Please check with your doctor to see if it is safe to supplement your Omega-3 levels. Omega-3 fatty acids are part of a larger group of essential fatty acids that are contained in cell membranes. They help regulate many critical biological functions and may have health benefits including helping to lower cholesterol, and decreasing inflammation in the body. There is also significant research that suggests Omega-3s can help reduce dry eye symptoms, as well as decreasing the progression of macular degeneration. How do Omega-3 fatty acids affect dry eye? The omega-3 fatty acids EPA and DHA act to decrease inflammation associated with dry eyes and blocked tear oil glands, thus improving tear film quality, and eye surface dryness. It’s important to note that Dry Eye is a complex disease, and the benefits of Omega-3 are best maximized within a comprehensive treatment plan coming from a thorough evaluation by a dry eye specialist. How Can You Get Enough Omega-3’s in Your Diet? One of the best ways to get Omega-3 fatty acids is to eat fatty fish such as halibut, salmon, catfish, striped bass, and albacore tuna two to three times a week. These fish are also recommended by the American Heart Association for protein and general well-being, as part of a balanced diet. Another means of obtaining omega-3 fatty acids found in fish is by supplementing your diet with fish oil, which can be found in capsule or oil form. It is important that these supplements be mercury-free, and manufactured in a quality way, to minimize contaminants. Caution: Some fish contain high levels of mercury; consult with your doctor regarding the safest fish to eat. Flax seeds are also a rich source of Omega-3 fatty acids. Flax seeds contain a different form of Omega-3, have no-animal by-products, and are an alternative choice for vegetarians. They come in several different forms; capsules, oil, or seeds. Some patients have experienced an upset stomach after ingesting fish oil or flax seed. It is best to ask your doctor for recommendations that maximize the effect of Omega-3s and minimize side effects. The best way to consume Omega-3s is in fatty fish or flax seeds, but there are other ways to increase your dietary intake. Many popular foods such as milk, yogurt, eggs and juice are now supplemented with Omega-3’s. It is also contained in walnuts, as well as some brands of whole grain bread, pasta, and cereal. Curious to find out more about Omega-3 and other ways to treat and diagnose dry eye? Our caring staff of eye care specialists can help treat your dry eye symptoms quickly and effectively with the latest in diagnostic and therapeutic technologies. Contact us to schedule a consultation to discuss your options today!